To a child, excavation can look like fun. There are big trucks, exciting new noises and plenty of dirt moving around. In reality, residential excavation can be a complex, intricate process and it’s important to do it right the first time. That’s why you need an experienced, licensed excavation company, like Mikula Contracting, Inc. Some people say that excavation professionals are simply grownups who have found a job where they still get to play with their Tonka trucks. Of course, they are actually a crucial part of any large, external residential project. For best results, make sure that the company you choose is qualified, knowledgeable and reputable. When you want to add to your existing living space, it’s not a decision to be made lightly. There are numerous factors to consider, such as whether the ground can handle it. Soil must be removed and shoring systems put in place. This takes the advice and capability of a quality excavation company. Excess water on your property can erode your topsoil, damage your foundation and negatively affect the appearance of your home. You may need a seepage pit installed underground to handle the issue. With most of your plumbing, electrical and septic systems located underground, excavation is often necessary to add to or fix problems in these areas. Trench shoring, underground utility installation and sewer digs also fall under the category of excavation services. Excavation is required before you build a new home. It is vital for laying the foundation, installing plumbing systems and making sure the land is safe to build upon. If proper care and planning is not done, your foundation can sink or your new home will be susceptible to shifting earth conditions. Huge boulders, trees, debris and removal of old structures are needed from many residential properties. Such elements can be a fire hazard and make your property look unattractive. These types of excavation services can significantly maximize your property value. Even if you are only clearing a small area, it can quickly turn into a big job with lots of heavy machinery. This is not something you should tackle on your own. This might involve land grading, backfilling or demolition. Excavation in this area is vital for exploration, construction and environmental issues. Whether you are installing a swimming pool or having one removed, you will likely require excavation services. You will need to have the area filled in properly to ensure your property is safe. We also take care of all permits and inspections. Your home is likely your biggest investment. 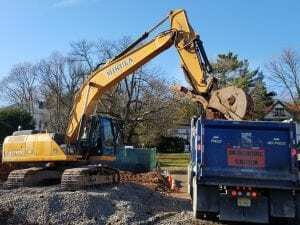 When selecting a residential excavation company, look for a business with highly trained professionals, a reputation for integrity and dependability and the proper equipment to get the job done. By choosing the right company, your residential excavation project will be completed on time and on budget. 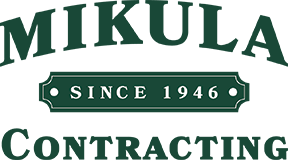 Trust the experts at Mikula to help you achieve your goals and protect your property.